Jose on Bermondsey Street is the first solo restaurant from critically acclaimed chef Jose Pizarro who was previously the driving force behind the Brindisa Group. . The restaurant exudes a warm cosy feeling, but is so tiny that it’s basically standing room only with a smattering of stools. We spent our first hour and a half at Jose on our feet, squeezed into a tiny corner with plates and glasses being handed to us over the heads of other diners. We eventually found more space, but (alas) with only one stool even though there was two of us. This was not a comfortable dining experience, especially as Jose has a no bookings policy. Nevertheless, the food was outstanding and very reasonably priced. 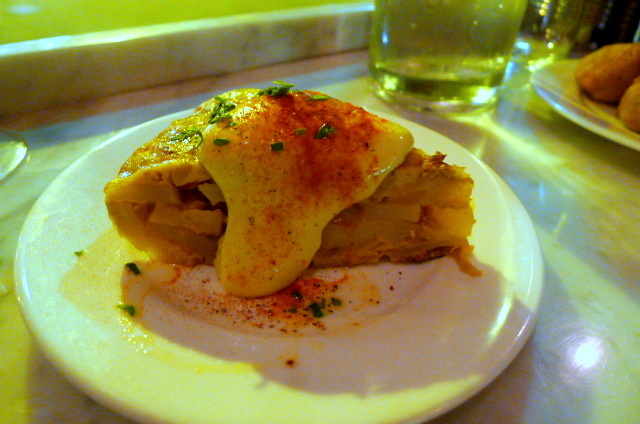 Tortilla (£4) filled with chorizo was scrumptious, and the meaty flavour of the chorizo gave the dish a fantastic lift. The accompanying aioli oozed lots of garlic-y goodness and worked a magic on the tortilla. 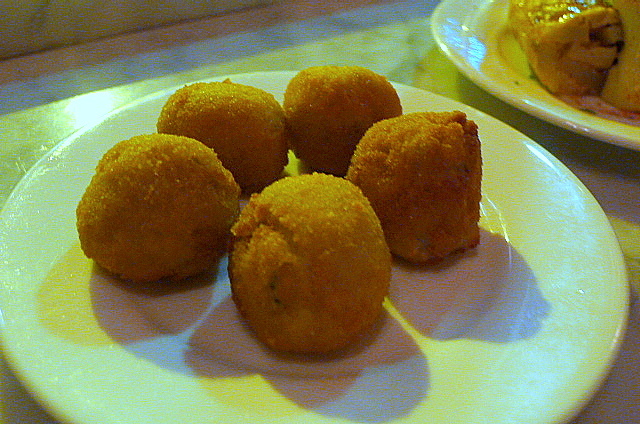 Blue cheese croquetas (£6) were crispy, but a touch too blue. It needed some jamon to cut the cheesiness. 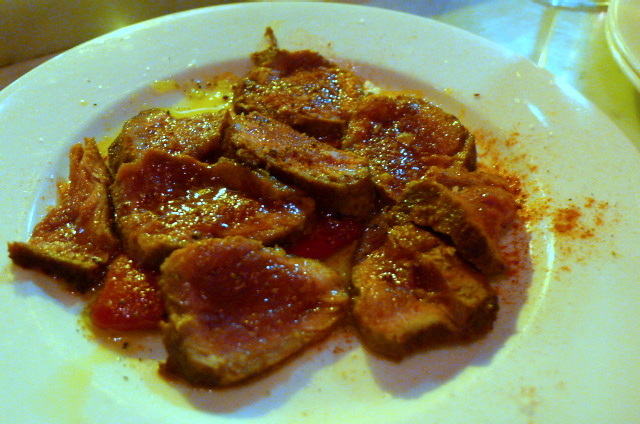 Ibérico pork fillets (£9.50), seared and served medium rare, were divine. Beautifully seasoned, the meat was tender and flavoursome. 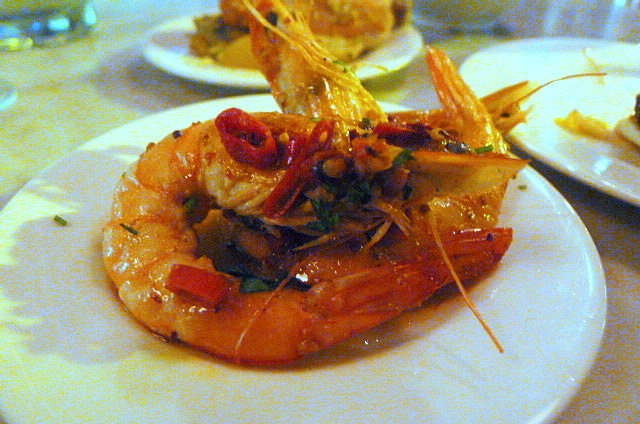 Prawns with garlic and chilli (£9.50) were tasty and nicely cooked. Although the prawns had been de-shelled, unfortunately they had not been deveined leaving them tasting of a little grit. A dish of seabream with morcilla de Ibérico and peppers (£7) was lovely. The fish was moist and fresh, and the richness of the morcilla with the sweetness of the peppers proved to be great accompaniments. 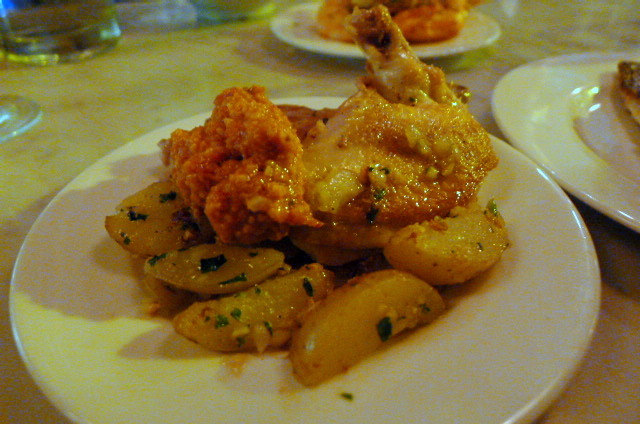 Baby chicken with potatoes and Romesco sauce (£6) was yummy. There was a good garlic kick in the lusciously nutty sauce which worked wonderfully with the moist and tasty chicken. 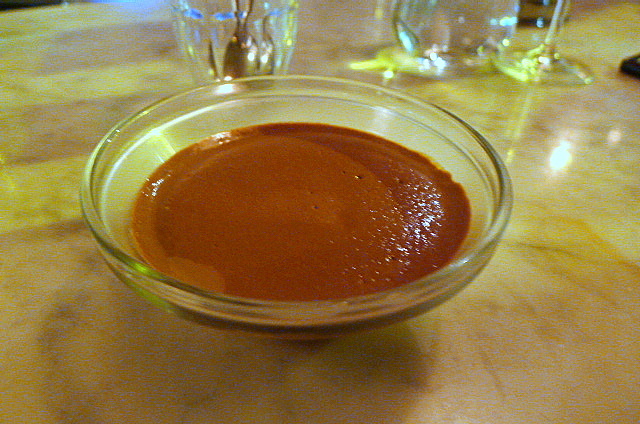 There weren’t many dessert options – just two – and we went for a chocolate pot (mousse) dessert (£3) which was nicely made. We enjoyed the food through and through, but we couldn’t wait to leave the crush that was our dining experience. If you are claustrophobic, this is not the place for you. But the food was so good I would go again, but perhaps not during a peak time. Price range: £20 – £35 per head. Excludes drinks and service. Have you got yourself down to Copita yet? Was there last night, really interesting tapas-style dishes. Very fun. Bring back bookings – detest eating while standing up, and adding insult to injury – having to pay for it too! will take on board you recommendation and check out Copita. Will let you know how it goes. I can’t agree with you more. I love RESERVATIONS!